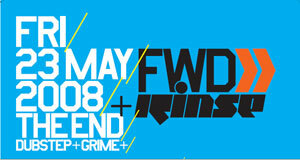 On the 25th of May, FWD>> relaunches as a Sunday session. In echoes of dubstep’s founding club’s earlier incarnation at Velvet Rooms, the night will run Sunday sessions’ at Plastic People. 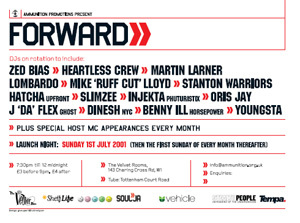 The first Sunday line up will be a tribute to the inaugural FWD>>. Playing on May 25th and selecting music from that first session onwards, will be Youngsta, Hatcha, Oris Jay, Benny Ill and Slimzee. FWD>> will also be re-issuing the first flyer, for old times sake. Speaking to FWD>> management, there’s a real buzz about the change of times, a sense, echoed in the enthusiasm of headz that have heard the news, that the move returns the club to it’s roots. There’s been many phases of FWD>>. I remember the first one in 2001 at the Velvet Rooms clearly. I’d been on at El-B to start a club night to showcase his sound, but the Ghost Camp were never one for organising things. It took people like Soulja and Neil Joliffe to step up. Not realising most people would be on “garage time,” I arrived far too early, only to find a club mostly populated by the bar staff. But by the end Velvet Rooms was full. I recall euphorically standing in the middle of the dancefloor, trying to convey my enthusiasm to Neil that they’d actually pulled it off. 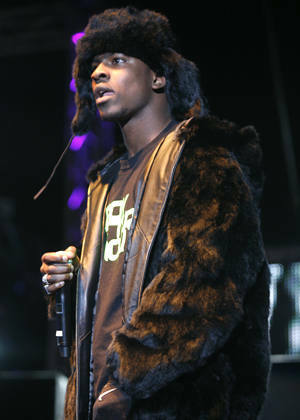 With Ghost arguably at the height of their powers, the night peaked with Jay Da Flex’ set. By the time FWD>> moved to Plastic People things had changed. UK garage as a movement had imploded and the club began to go it’s own way. Months would go by with the dance floor barren, such that when the club began to feel full, people would enthuse about there being oooh, 40 people there. This is even before the term “dubstep” itself, back when people talked about “the Forward sound,” which meant the confluence of dark 2step/4x4, breakbeat garage and proto-grime. What united those nights and undoubtedly kept them alive, was a sense that it was by the scene, for the scene. People came down, got to know people became inspired, went away, made beats, shared them with the DJs and heard them tested over that amazing system. It was dubplate culture at it’s finest: and look at the results. But in the scene around FWD>>, things changed. Instead of being the only dubstep club, anywhere, it’s now just one of many in London alone. The DJs it supported, from Hatcha to Youngsta, Mark One to Plastician, Kode9 to Skream, have all gone on to become international DJs, such that hanging out together is harder when everyone’s booked for Japan or Glastonbury. Sunday Sessions at FWD>> should change all that, stop the disinterested passing traffic and random City shirtboys and encourage the headz to pass by. I for one will be there. FWD>> also return to The End on the 23rd of May. The lineup is pretty large, personal highlights include a Martyn 2 hour set, Ghetto, Appleblim, TRG and the chance to see more dubstep fans looking baffled by funky. He he heh. Wonky: pronunciation [wong-kee] –adjective, -ki•er, -ki•est. 2. Musical flavour - *not* a genre - transcending multiple scenes in summer 2008, characterised by an outbreak of unstable midrange synths. As summer 2008 approaches, a theme emerges across myriad existing genres: the mid-range is being hijacked by offkilter synths that are about to explode. 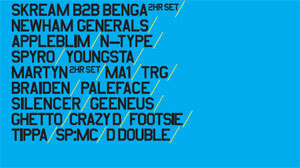 Crossing hip hop, hyphy, grime, chip tunes, dubstep, crunk and electro, one flavour unites a network of exciting sounds. Wot do u call it? Wonky. Read my Pitchfork Wonky special which features Rustie, Hudson Mohawke, Quarta 330, Ikonika, Darkstar, Zomby, Flying Lotus, Samiyam, Starkey, Dev79, Joker, Guido, Gemmy, Pinch and Trim. This week we return to our monthly Rinse show, tonight 11pm-1am. Add the station to MSN rinse.fm@hotmail.com. You can still download last week's show from the Rinse podcast (via iTunes) or from the Rinse blog here. You can still download the February show here. Blackdown: So Wiley’s “Wearing My Rolex” has become the first tune featuring a grime artist to be signed to a major is ages. The dance to it and your follow up “Rolex Sweep” has become a YouTube phenomenon. Tell me about how “Rolex Sweep” came about? B: Tell me about the dance to “Rolex Sweep,” because people know about the dances in hip hop, with Soulja Boy in the states have been dance moves with hip hop tracks, but that hasn’t been the case with grime much. So how did you decide to do it in grime? B: The thing is a lot of other grime MCs take themselves very seriously, and I don’t know if they would have allowed themselves to be seen to dance. What makes you different? S: “The way I see it – I was having this conversation with Wiley the other day – I think a lot of us, as artists, forget we’re the pioneers of the music. The kids have just come along and grown up on grime and they’re really narrow minded about things and they think an MC is supposed to be a specific way. He’s supposed to wear a specific hat and dress a specific way. 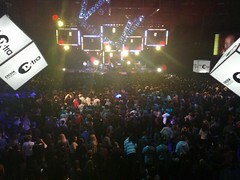 B: You recently played to an audience of 5,000 at the 1Xtra Live event. How did that feel? 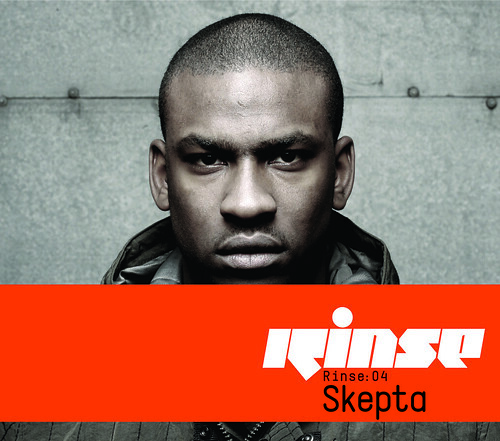 DJ Skepta mixes the next edition of the Rinse mix series. New Pitchfork column from me featuring Trim, Ghetto, Cluekid, LD and rise in jungle flavours. 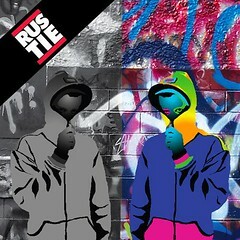 Download this show from the Rinse podcast (via iTunes) or from the blog here. You can still download the last show from the Rinse blog.